You have been chosen in the fight against an evil organization known only as M.O.E. (Monsters Of Evil). To battle this mysterious foe, you have been given the power to transform into a Magical Girl (or boy ). While transformed, you are able to use the attacks of your Pokemon and even become that Pokemon temporarily! But beware... You have all the same weaknesses. 1. Your character has the moves and type advantages/disadvantages as the pokemon they represent. 3. Three characters max per person (at least one evil, please). 4. MOE "Grunts" and Scientists on either side are played by anyone unless otherwise stated. They're NPCs. 6. MOE characters can be human or evil Senshi. It's really whatever you want for a bad guy. Short Bio: You will never find a more bubbly, optimistic girl like Megumi. She always attempts to see the good in everyone and tries hard to find a way for everyone to be happy. Her main failing is that she can be a little gullible but she does learn from her mistakes. One day, something happened to her and she found herself transformed into a Pokemon Magical Girl and was suddenly thrust upon the responsibility of defeating the M.O.E. organization. Short Bio: Kurai was just a normal 18 year old girl. She had an alright job, alright parents, alright friends. As long as you seem experienced, she will follow you without question and she is a friendly person. She was extremely loyal to that alright job at the PokéMart in Cerulean and she was always happy when she got to see her Mightyena. She had raised it since it was a little Poochyena. One day however, she thought that the PokéMart was sending her out for a promotion when she got turned into a Pokemon Magical Girl in order to fight M.O.E. Short Bio: Polly is a spunky teenager who grew up in the city of Cerulean. When she was younger, she ended up in the wrong place at the wrong time along with a Pokemon trainer who was passing through town while Team Rocket was conducting one of their schemes, but Polly wasn't afraid of them. As a thanks for saving the trainer, he caught and gave her a Poliwag and the two had become inseparable since. But because Polly was infamous for being in the wrong place at the wrong time, she was transformed into a Pokemon Magical Girl in order to defeat the M.O.E organization. Polly is very hot-headed and tends to think before she acts, but she's still a good person at heart. Short Bio: Lily worked in a green house, but while she is from Celedon City, she's never actually met Erika the gym leader, though she has cultivated plants for the gym and special food for the Pokemon there. She received a letter from a plant cultivating convention, but when she went to the meeting, she instead was turned into a Pokemon Magical Girl and told to defeat the organization M.O.E. She was the first of the group of Senshi and understands the situation, but is far from being the leader. 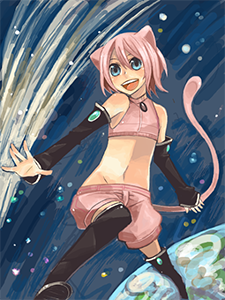 Short Bio: Talia is a small, shy girl native to Cinnabar Island. But when it comes to fire, do not be fooled. She tends to go a little crazy about her obsession with fire (pyro-maniac, much), which makes her the prefect candidate for the Senshi of Fire. She is very passionate when it comes to her interests and beliefs. Short Bio: Matthias was once a lover of all Pokemon. However, something within him changed after encounter the great and powerful Mewtwo. Or was it really Mewtwo? Ever since then, he began to change drastically and eventually discovered his gift of telepathy. A dark plan began to form into his mind, which he plans to bring into fruition. Matthias is know to all as 'M.' He refuses to reveal his true name and his true intentions. Can his soul be saved from the dark? Short Bio: Karos is one of the more talented members of MOE. He's a Pokemon thief and a cat burglar. While not particularly loyal to the organization, MOE does pay well for his talents. He doesn't care what the organization's goal is so long as he gets paid. He has the occasional run in with the magical girls, but they're easily dealt with. Short Bio: Bagu grew up as a normal Pokemon trainer, just trying to live the dream. But that dream came crashing down when he lost all his Pokemon to another trainer in a gamble. The only thing he had left was his Pinsir. His Pinsir became his only friend. When he heard about MOE he jumped at the chance, knowing that this could possibly get him back into game and that he could possibly get some form of petty revenge. Lily sat in a meeting room alone, wearing a green dress with pink petal sleeves. Her hands were folded neatly in her lap as she waited for her boss. She was the first of the experiments, or so the scientists had told her, and had been fused with a Meganium. Today, she was to meet the rest of the "senshi" as they called them. She just hoped the rest of them would be nice. Karos walked into a large office, his gun at his side rather than in his hand, where he wished it was. The man who was paying him had always given him the creeps, and though he didn't know why, he didn't care so long as he was paid. He just wished he could have his gun ready just in case. "You wanted to see me?" he asked, pretending not to be interested as he scanned the room for anything suspect, like a security camera. The door was open when a girl with short, pink hair stuck her head inside, curious to see if anyone was in the room. Then, seeing the other girl that was sitting down already, she promptly took the seat facing the green haired girl around the meeting table, which was a rather nice meeting table- a long, polished slab of wooden splendor. But, the pink haired girl noticed, the rest of the room was rather nondescript. She smiled a big smile and introduced herself to the girl in the flora-inspired dress. "Hello~! My name is Megumi, what's yours?" Kurai stepped into the room. Still unsure of what she should be expecting. She saw the two other girls sitting there, they looked normal enough, except for their clothing, but what should she be talking, she looked the strangest of them all. "Hello" she said as she took a seat in close proximity to the two, smiling a little. "My name is Lily. It's nice to meet you both. And you are...?" She directed that last question to the girl who'd just come in. Judging by the clothing, this person was also one of the Senshi, and seemed just as confused as the rest of them. That meant there were two left. The scientists and their boss had mentioned that there would be five Senshi total. "Hiyah~" Polly kicked through the door, not bothering to care if she had startled the others. "I'm ready to fight some bad guys! Where are they? Let me at 'em!" The energetic girl clenched her fists and punched at the air. The next girl who entered gazed at the energetic girl as if she were afraid. She made sure to keep her distance from the blue haired girl before quickly going over to one of the vacant chairs. She continued to stare at the girl nervously from where she was sitting. The chair in the room slowly turned, revealing a young man. He sat there with his hands clasped, staring at Karos with a frown. "You're late," the young man's voice echoed although his lips did not even move. "The name's Kur-" She couldn't finish her sentence before the energetic girl kicked through the door. Kurai looked at her, judging by getup she was obviously one of these "Senshi" they were here to meet. "There are no 'Bad Guys' yet, be happy about that too." Kurai said before giving a wave to the shy girl. "Well, it's... a pleasure to meet you all. My name is--"
"That enough of the pleasantries for now, Miss Lily," said a voice on a TV monitor. The screen came to life, though there wasn't anything to see on it. Just a white background with a shadow of a man with no discernible features. "As I explained to you all, you are now Senshi fused with Pokemon. 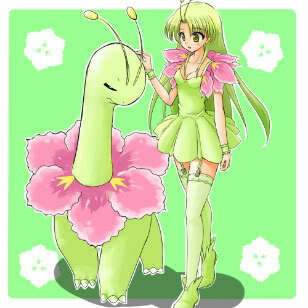 Lily, the girl in the green, is fused with Meganium. 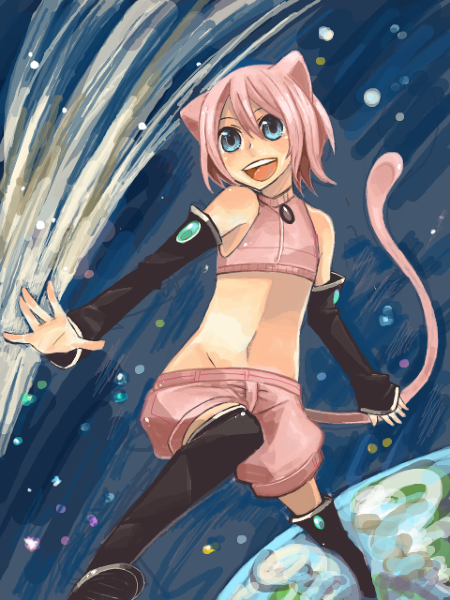 Megumi, the pink girl, is the legendary Mew. 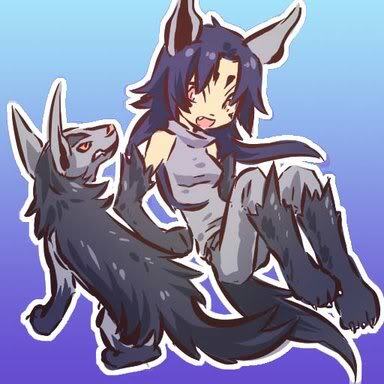 Kurai in the black is Mightyena. Polly in the blue is Poliwrath. And lastly, Talia is a vulpix. Now then, you were all chosen for your compatibility with the Pokemon you were fused with. Your job is to defeat the evil organization MOE. We're not sure what they're up to, but they have been brainwashing Pokemon, turning them into bloodthirsty monsters, to wreak havoc on humans. Your job is to fight these Pokemonsters. Contain and capture or destroy them. That is all." The monitor went blank. Lily sighed at the rudeness of their mysterious "benefactor," if you could call anyone who kidnapped girls that. "Well, as he said, we've all be brought together to defeat the monsters." She smiled weakly. "I'm never late," Karos replied. His expression didn't change. "What did you want me to do? Steal more Pokemon or...?" He let the question trail off. He had a feeling he was going to be sent to create another of those monsters. Polly stopped momentarily to listen to the speech. When she heard Lily speaks of monsters and she instantly looked around, as if she were expecting them to pop up any second. She frowned. "Well, I don't see any monsters..."
Talia shyly waved back at Kurai before listening to the speech as well. She let out a small gasp and curled up into a small ball in her chair. "I don't like m-monsters...." she said softly. Matthias closed his eyes and sat back into his chair. "I need to you do something important for me," he spoke without using telepathy. "That pathetic man is on to us and it seems he has created some monsters of his own to stop us. I need to you find them and engage in a fight, figuring out what we're up against, and then report back to me with your data. Understood?" Karos ran his fingers through his hair. "That's not gonna be easy. We have to draw them out with something." He fingered his gun longingly. Sadly, a random shooting or robbery, his specialties, wouldn't be enough to draw out anything that was created to take down MOE. "I'll get one of the test subjects from the labs," he said at last. "I'll make a demonic Fearow or something. Just big enough to get their attention and to test their abilities on." He left the boss and headed down to the laboratories, where hundreds of Pokemon sat in cages, snarling as he passed. They were not meant to live in these conditions, not that Karos really cared. Pokemon were just tools as far as he was concerned. These were just psecial tools. "Up the dosage on that one," he said, gesturing to a particularly terrifying Fearow that beat against the bars with its wings. "Put it in one of the traps." The scientists nodded and hurried to obey Karos' command. He might not have been in their group for long, but he'd been loyal enough to become an extension of their boss. Even if that loyalty originated in his paycheck. One of the doctors injected the bird with a steroid that would make it go berserk and grow to ridiculous levels. He then forced it into a Pokeball that would contain the creature until it was released. This he handed to Karos, who nodded his thanks before heading off to release it in some unsuspecting town. Megumi tilted her head a little at the sound of the word monster and looked upwards towards the ceiling as if thoughtful for a moment, her tail swishing lazily back and forth. "Monsters, huh. Do you guys think one will appear soon?" "Well, I certainly hope not," Lily said. She had taken on one of the monsters once, and it had been terrifying. It had been just a Tauros, but it was three times the size of a normal Tauros. And far more angry and powerful. She'd been nearly killed, but had escaped with just a few broken bones. That was part of the reason they had decided to make more Senshi to take on these overpowered Pokemon. "Monsters eh? What kind of monsters are we talking about? Are they sentient or are they feral? That wasn't the most descriptive briefing" Kurai said, although realizing that it would probably be no use until they actually got to see one of these things. She sighed and looked around at the girls in the room, they seemed to be a nice bunch. Karos landed his Pidgeot in front of the Poke Center in Saffron City. He then tossed the volatile Pokeball someplace, where it would pop in a few minutes on a timer. Then he walked casually away, as if he hadn't done anything. He'd have to hang around this time to be able to report back the counter-attacks measures of their enemies. Soon, he thought. Very soon. "They're... big. And feral. At least, I think they are. It's hard to tell, since MOE leaves without commanding it..." She shook her head. "I'm afraid I don't know much other than they're too dangerous to handle alone." The screen lit up again. "Girls, a Pokemonster has appeared in Saffron. Pack your bags, girls." "Yes!" Polly shouted happily as she jumped for joy. "Action at last!" Talia trembled slightly. "O-Okay. If we have to..."
This certainly wasn't a good thing. A Pokemonster in that crowded of an area was dangerous. And for the Senshi themselves. There wouldn't be a lot of room to maneuver. They'd also have to keep the regular humans out of harm's way. The sooner they got there to handle the situation the better. "Follow me," Lily said, leading the way out of the conference room and down a series of hallways. At the end of one of these halls was a room with an Alakazam. "He'll teleport us to the place we need to be. Right, Alakazam?" The Pokemon nodded in agreement. 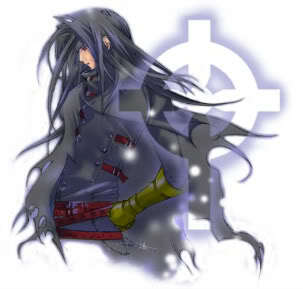 Kurai sighed. "Alright. Let's get this over with." She said following Lily, not exactly the most excited about the endeavor they were about to partake in. Due to inactivity, I've made a 2.0 and hope we can get father next time.